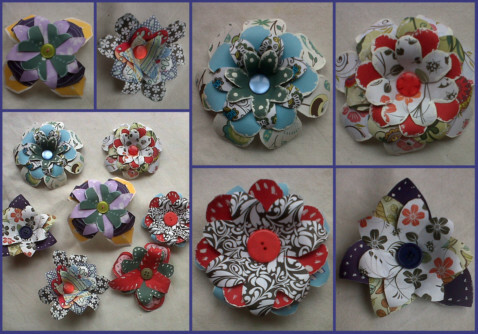 gorgeous paper flowers from paper scraps, handmade paper, tippex, felt-tip pens, buttons and lashings and lashings of PVA glue...such fun!!! They were inspired by the amazing *Jennibellie's fabulous tutorial on You Tube. They can be used for embellishing the handmade books we made last week, gift boxes, cards, gift wrapping or attach to a pipe cleaner or art straw "stem" to make a dynamic paper floral display. We discussed other uses and thought that if you used fancy edged scissors it would give you another dimension. Also, making them from white or cream papers would be lovely as wedding favours for sweets or sugared almonds. Using Christmas papers and colours attach a wire or pipecleaner to make a wreath or decorations for your tree.